D is for … ? I hope you enjoy, and that you’re having a creative weekend, whatever that means for you! I’ll be back with an American actor tomorrow, one of my faves (and Hub’s also). See you then! < C is for … ? Well I know who, but I won’t say. Mum’s the word, lol! Thanks Fi. oops…did I ruin it yesterday? Keeping my mouth shut today. Another good sketch. Not at all, Jo. I hold all correct guesses in moderation, so guess away! And thanks for the compliment. Good drawing and he looks familiar, but this one I do not know. Thanks! I really expect that with this one. The film itself is 20 years old but I just couldn’t resist drawing him after watching it. i really like how the eyes turned out! sometimes my favorite artistic expressions happen by accident! Yay! I definitely know who this is. It’s my favourite book! It’s actually quite a good likeness to Colin Firth too. Well done and excellent choice of a subject for D :). Yay! I won! 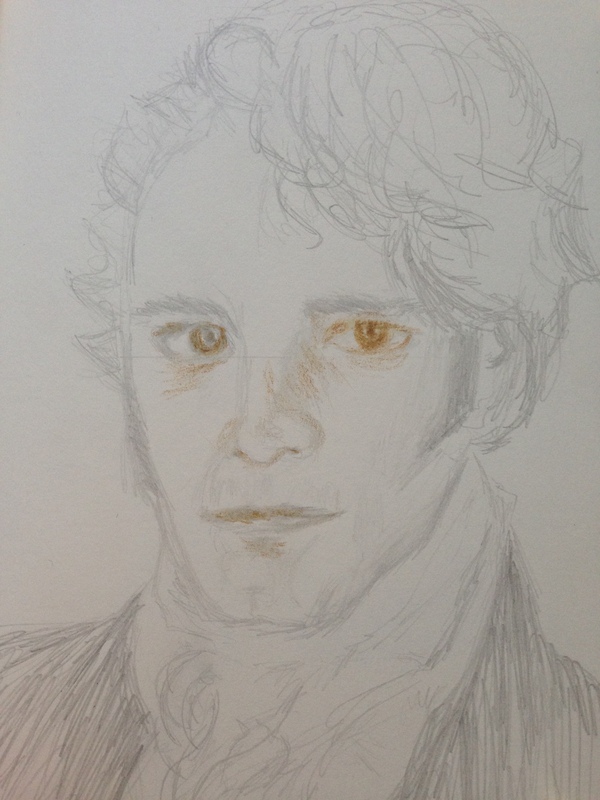 How could I ever resist being the first to guess on a beautiful portrait of Mr. Darcy. After all, he is every woman’s dream man. PS – It’s my favorite book also. Always a joy to reread. This is an amazing drawling and I feel like I know who that is but I can’t put a name to him! You’re not the only one Jodi! Thx for the compliment and for visiting, as always! Sorry I was on the phone. Dingdingding!! You got it! Lots of other correct guesses I need to approve too. You’re really good at guessing faces, Jodi! Stick with me, I need good guessers lol!! Actually it’s you who are really good at drawing them!!! I don’t know how you do it!! I envy that talent!! You’re extremely talented! Look at what you can do. I promise if you picked up a pencil every day and immersed yourself as I’ve done since September (no joke), you could do it too. I used to think people can or can’t. Now I know based on my own experience … you just have to keep doing it. And reading about it. And watching videos. But mostly just doing it. Seriously. I’d bet serious $ on it. You could do it. So can anyone reading this! Hmmm.. I just may try some day 🙂 So you have no formal education in it? Is the character Mr Darcy? I don´t know the series, but this is sure a really cool portrait!!! I have absolutely no clue who this could be, but it reminds me on Colin Firth. Plus he is English and really quite dreamy (still…)… Actually I don´t really know English actors… Anyway, the drawing is wonderful!!! Thanks, Ann!! You guessed it!!! I know who I immediately thought of. Very well done! Thanks!!! Don’t keep us in suspense! Who did you immediately think of? haha, nice! I’m so happy so many people guessed this one! I thought it’d be much harder. I’m so glad you enjoyed it, too. it was fun. I don’t check in often enough, but I’m glad I did! I’m glad you did too! I need good guessers like you! 😀 Glad you enjoyed it. What was most fun was that I guessed it by seeing the image, not by the hints given. So you did great. Wow, thanks!! That’s even better. Thank you for letting me know that. Darcy. I love pride and prejudice. I’m a junky. Great job! Thank you! I love the version with Keira Knightley (sp) too. Aww thank you! Much appreciated.